Quitting and failing aren’t synonymous – although, they can both be equally hilarious. Montreal funnyman Al Lafrance tells tales of giving up and messing up in this solo show. Dollars to donuts, this one’s a must-see for lovers of comedy and storytelling. WINNER: Just For Laughs award for Best English Comedy at the Montreal Fringe. And also check out these great reviews by CJLO, 9to5.cc, The Montreal Times, as well as this amazing feature on Newborn Theatre! And here’s an interview I did for After The House Lights. 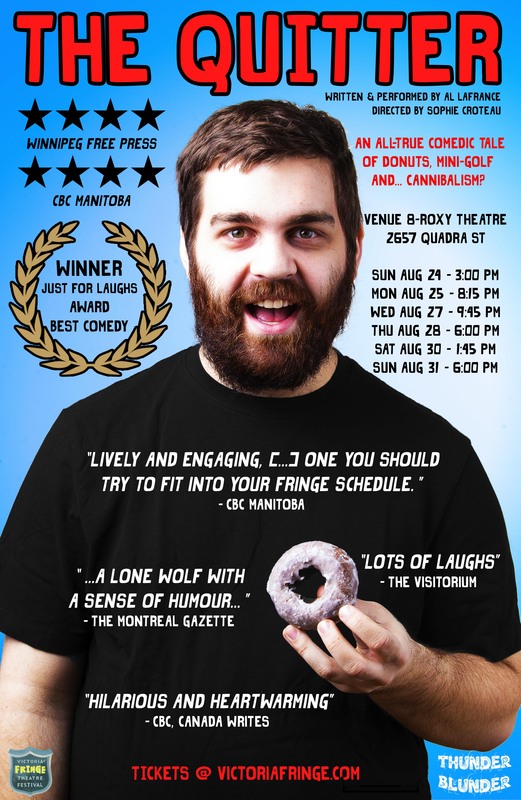 The Quitter completed a successful tour of Fringe festivals all across the country over the summer of 2014, was revived briefly in 2015, and will make its 3rd appearance on the Fringe circuit in 2016. Studio 1398, 1398 Cartwright St. Performed as a fundraiser for the SOLOS Festival. Thanks for bringing your show here. You might enjoy my book, Quitting.